Published under the pseudonym Jack Adams (but copyrighted under the names Alcanoan A. Grigsby and Mary P. Lowe, who are presumed to be the true authors), Nequa, or, The Problem of the Ages was printed in Topeka, Kansas in 1900. Though fairly typical of other terra cava narratives concerned with exploration, spiritualism, and utopianism, there are a few unique features, not the least of which is a female narrator. The undersigned [Jack Adams] claims no credit for the concept of an “inner World” in which the great economic problems which now confront the people had been solved in the interest of humanity and ideal conditions established for all. This was the leading thought in a work by Dr. T.A.H. Lowe, deceased, which was placed in the hands of the writer by his widow, Mrs. Mary P. Lowe. It contains a glowing description of the ideal conditions which would prevail under the practical application of the principles of Freedom, Equity and Fraternity in human affairs but the author died before he had an opportunity to work out a practical system by which the masses of the people, situated as they now are, without even a clear understanding as to just what is the matter, could commence with existing conditions, and peacefully, effectually and speedily establish the much to be desired system of absolute justice in distribution which he described. EQUITY is a weekly paper devoted to the discussion of fundamental economics and the higher ethics of business, published at Topeka, Kansas. The pretence of Jack Adams being a real individual is carried on. Success seems to have eluded both ‘Jack Adams’ and Alcanoan Grigsby as there is no record of any further publications under either name, and nothing else to be found under ‘Equity Series’. The first chapter down not even begin from the perspective of Jack Adams, but a one Dr. Tomas H. Day (a change in surname, but perhaps the Dr. T.A.H. Lowe of the Explanatory?) in Kansas City who receives a visitor, Leo Vincennes, bearing a message and manuscript from Jack Adams, a mutual acquaintance of them both. Vincennes tells Day that he encountered Jack at Cape Lisburne in Alaska, where Jack arrives in ‘a mechanical contrivance for navigating the air’ (p. 8). Jack proceeds to tell his old friend Vincennes about his travels ‘past the great ice barriers, and his discovery of a World of Truth beyond’ (p. 13) before presenting Vincennes with the manuscript to be taken to Dr. Day for publication, to be ‘broadcast over the world’ (p. 13). The letter included states, “In the name of civilization I ask that whoever may find this package shall place it in the hands of those who will publish the MS. Contained therein and have it scattered broadcast over the world, so that the discoveries recorded shall not be lost to humanity. Nequa” (p. 14). This is the same sort of appeal seen in many other terra cava frames, the record of exploration that needs to be heard by the entire world, not for any profit, but for purely philanthropic motives. Appearances of altruism are more likely to win the reader’s trust, and their reception of a utopian message. 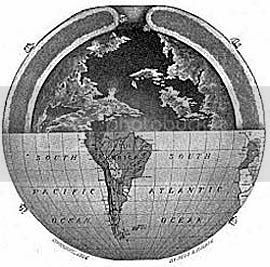 It is the latter that is so often couched in the hollow earth novel, providing a theoretical landscape for a theoretical social structure. Day also addresses the reader directly at the end of the chapter: ‘And now, dear reader, I shall give you the contents of this remarkable manuscript, from the pen of my sailor comrade of years ago, Jack Adams, but known in his new home as Nequa, the teacher. Ponder well the lessons taught in these wonderful discoveries’ (p. 15). Once more the reader is being urged to treat the tale as one of moral and intellectual instruction, from a ‘Teacher’. Jack’s identity as a female is also not revealed at this point by Day, so, I will continue to refer to ‘Jack’ in the masculine. As a narrator, Jack is presumed to be reliable via the personal details provided, the demonstration of education, intelligence and morality. The narrative itself is more dialectic than diegetic; Jack does not summarise events for the readers so much as analysing them via long chapters of dialogue and debate. The whole of chapter XII (38 pages) is a lecture on the historical, moral, economic, and spiritual development of Altruria into a utopia, a place that has finally solved ‘the problem of the ages’: poverty. Jack Adams, Nequa, or, The Problem of the Ages (Equity Publishing Company: Topeka, Kansas, 1900), p. vi. I would like to quote you on the back cover of the new edition of NEQUA. If this is O.K. I would add the quote, your name and web address to the back cover. Please send me an email if this is or isn’t O.K. No problem. I found your research on Grigsby and Lowe quite illuminating for my PhD. You’re the only other person to have ever looked at the novel. Good luck with the reprint. “Nequa” was one of the few enjoyable hollow earth narratives I got to read over the last few years. Thank You, I was interested in your Latin feminine ending as the reason for the word Nequa. My looking has taken me in a different direction. I also do not think that a negative term used as a name for an upbeat person like Cassie follows logically. U nequa l is the condition of the outside world and Nequa is inside the unequal, The true teacher is inside. Certainly a fair argument to be made for that. My dissertation supervisor and I went back and forth for an entire afternoon trying to settle on an interpretation/translation we could agree upon, but perhaps more consideration should have been given to the character herself instead of straight linguistics. There is another explanation . The area that Grigsby lived in for a couple of years was home to some mixed marriages. Several of the women (Native Americans) had the last syllable of their name -qua this was among the Algonquin linquist group which included Potawotamie, Kickapoo, Sauk and Fox. Squaw, a derogatory description, has been suggested as a term for women used by whites, but with no agreed upon definition. Sound wise it contains the -qua. I need a Mail Address so I can send you a Thank You copy of the book for letting me use your quote on the back of the book. Very well done on the book! Can’t wait to see it, resurrected after all these years. I already have a request from my old supervisor to do a review for “Foundation” in England, and I’m sure I can get one into the SFRA review as well. No worries. I have one for “Three-Body Problem” that I have to finish and send out, so “Nequa” will probably go into the edition after that. I will be sure to let you know when they give me a publication date so you can be on the look out! As I’ve told everyone, you and I are probably among the only two living people on earth who have read Nequa – hopefully we can change that!